Beef Jerky Fundraisers are great for schools wanting to do a snack food fundraiser. Unlike candy, beef jerky fundraisers pass many of the school's lean standards. This allows the beef jerky fundraiser to be sold in schools! Jack Links creates great tasteing beef jerky and is healthier than a candy alternative being 97% fat free! 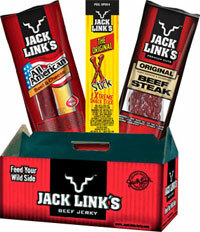 Jack Links also offers many of their beef jerky kits at 50% profit. The highly popular beef jerky X-Stick offered by Jack Links is great to sell by itself or within many of the Fundraising Kits that Jack Links offers. Ask us to find the best case variety for you! If you are looking to purchase Beef Jerky Fundraisers, please fill out the short form below or call (866) 674-7317 and we will find the fundraising dealer that will provide the best profit for you and your group.